I came off the Wangapeka Track with a severely swollen knee and pretty limited range of motion. I took it easy for a while, and the swelling went down, but the range of motion wasn't returning and any hikes with steep downhills (quite common around here) were very painful. I finally went to see a doctor who referred me to a knee specialist and a physiotherapist. I still haven't heard back from the knee specialist, but I did see the physio. Using old-school techniques, he did actually increase my range of motion, but the pain still comes back on descents, as does the swelling. A second physio theorised that ultimately I would need surgery, but suggested full dosages of anti-inflammatory drugs for the duration of the hike. Both thought hiking poles would be beneficial but the knee support wouldn't do much. So I started the hike taking 2400 mg of ibuprofen, as well as using a knee support and walking poles. I also decided to go with a hiking sneaker rather than my boots. 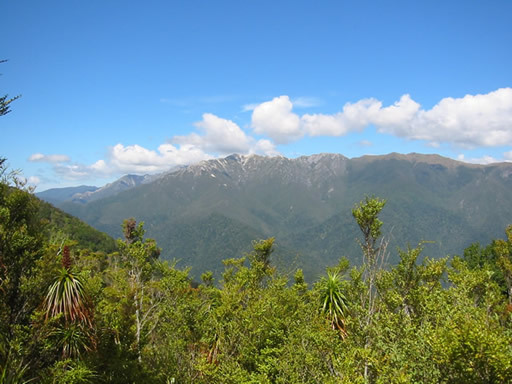 The Heaphy is one of the easier walks in the country, with gradual climbs and descents, and no scrambles. The footing is very good, so I decided to forego ankle support in favour of more comfortable toes. My hiking boots cramp my little toes in a way that leaves me fantasising about a toe-ectomy. I decided that the extra stability of poles would more than offset any ankle support from the toe torture device boots. In my hiking around Nelson, I had found the knee support helpful, so I decided to take it as well (in spite of what the physio said). Fortunately Susan wasn't panicked that she was heading out in the wilderness with a crippled person who might fall apart at any moment. Last year, John and I did a couple of hikes (The Kepler and Caples-Greenstone) with Susan when she came to New Zealand for a visit. These were just warm-ups for her climb up Mt Aspiring. My knee had given me some grief on these hikes as well. But she enjoyed her trip here enough that she decided to come back and do more tramping (and force us off our bikes for a few weeks). Her friend, Maureen would join us after the first week. 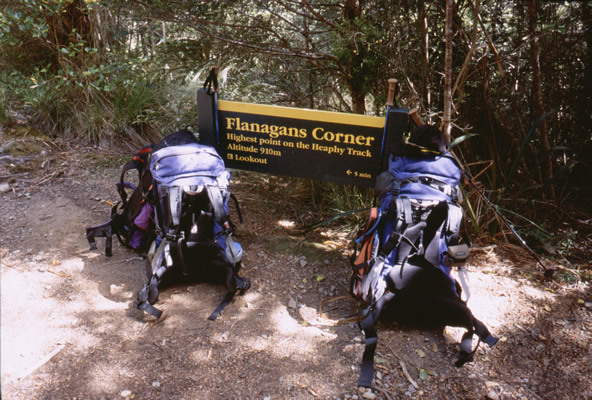 Then we'd all do a tramp together on the Queen Charlotte Track, before the two of them set off for an 8 day tramp over Rabbit Pass. But I'm getting ahead of myself. 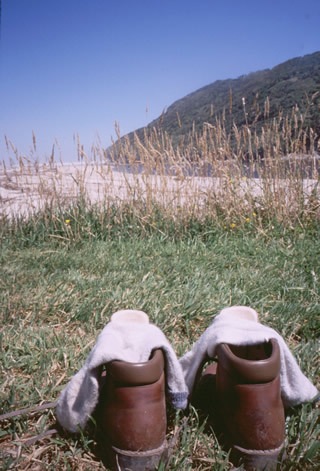 First John, Susan and I would hike the Heaphy. 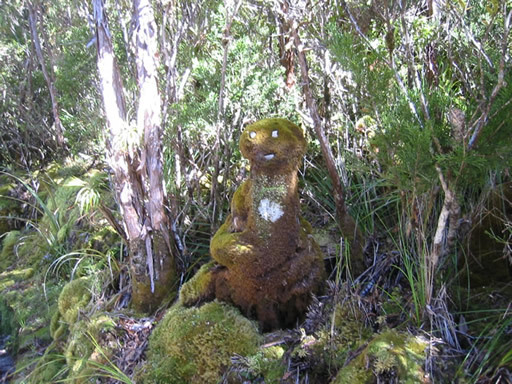 The Heaphy is a well known Great Walk in New Zealand. Great Walks vary a bit, but tend to be the more popular and well known walks, often with easier terrain, great scenery, and very nice huts. The huts standards do vary a bit. Most great walks have a reservation system in the high season, and bunks are guaranteed, but the Heaphy is an exception. The huts are very nice and have bunks with mattresses, as well as gas cookers, running water and even flush toilets. But since numbers aren't limited on the Heaphy, it is advisable to bring a tent and sleeping mat during the busy season, in case all the bunks are taken. Trying to eliminate additional stress on my knee, John carried both our tent and stove. Otherwise, I did carry all my own gear, sleeping bag, mat, and a fair amount of the food. John is bigger and stronger afterall - he should carry more! Anyway, we set off from Nelson, early in the morning on a bus up to the start. It's about a 4 hour bus ride, so we got to the beginning of the track around 11AM. After lathering up with sunscreen and taking the obligatory starting pictures, we signed in and began the long climb up to Perry Saddle. When signing in, we made note of a party of 8 ahead of us. That would help fill the hut! The first part of the track is quite wide and smooth, and a steady but gentle climb. Ever since coming to New Zealand, we'd heard how we should ride our bikes on the Heaphy - since it is such an epic adventure, and so rideable. Only problem is that it was recently made part of a National Park, and biking is not allowed in National Parks, except on roads. Well it's been a hot topic amoung cyclists in the area, and folks are trying to get the policy changed, so that cyclists can at least use the track in the low season. 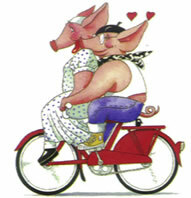 It is an old stock route and is quite rideable. It does seem a shame that DOC excludes cyclists from their target users of parkland. 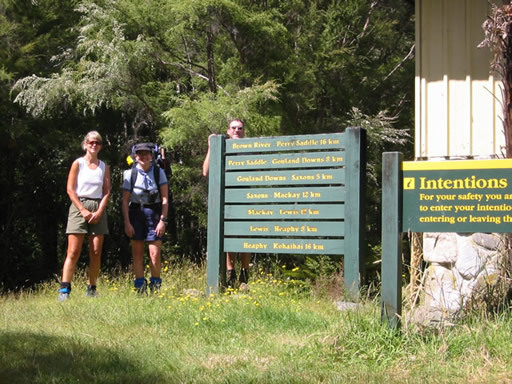 Our next planned hike, on the Queen Charlotte Track, is a great example of a track that is shared by trampers and cyclists, with part of the track restricted to hikers only during the high season. It would seem a similar arrangement would serve all quite well for this track. It is currently under review, and could well change, but not before we leave NZ, so we'll just have to be content with walking for now. Anyway, we started the steady climb up to the saddle. After an hour or so, we came to a nice bench and took a short break for snacks, and to rest or feet and shoulders (as we were being reminded that we hadn't been carry heavy loads up hills for a while). While stopped several groups of hikers passed. There are 24 bunks at Perry Saddle Hut. I mentally subtracted off bunks for the party of 8, and each of the groups that passed. We did have tent and stove and such, so it wouldn't be a big deal to camp if we had to. Of course, after we restarted from our break, we'd then pass each of the groups that had passed us. Power of suggestion must have led them to take breaks too. It was unusually humid for this time of year, and even though the climb wasn't steep, we were working up a good sweat. Our breaks were welcome, and the hut would be as well. After a few hours, we came to a shelter. Many of the folks we had to-ed and fro-ed with stopped for lunch here. We'd had our lunch a bit earlier, so we made a brief stop to top off water bottles and pressed on for the saddle. The viewing spot at the saddle is a bit off track, so we dumped our backpacks and headed up to take it all in. It was here that I discovered that I'd forgotten to recharge my camera battery, as well as my spare. So I had a pretty limited number of shots! Fortunately John had his camera with slide film, and Susan had hers, so we would still get lots of pictures. The view was pretty impressive. After walking uphill through bush all afternoon, it was very nice to get a wide open view from up high. We started down toward to hut, and notice what seemed like tracks from a big piece of machinery. After a while, we were passed by a 4 wheeled motorized cycle. I joked about asking for a lift for my pack, but to be fair, it wasn't that heavy. A short while later, we saw another ranger heading back down on the quad, this time towing a trailer, containing many items, including a kitchen sink! I suppose if you are going to carry that much, you need more than a simple backpack! A few minutes later, we started hearing heavy machinery and the buzz of a generator. When we arrived at the hut, we were greeted by deisel fumes from the generator, and a small digger, as well as the sound of lots of saws and hammers and such. So much for relaxing at the hut after a long hike. But what was more frustrating was that half of the hut, a bunkroom with 12 bunks, was reserved for the contractors. Additionally their stuff was scattered everywhere. I couldn't even sit on a bench to remove my shoes because it was cluttered with drills and such that had just been left haphazardly everywhere. When we went inside, a large part of the common area was filled with coolers, and boxes of food. They even had a toaster. I didn't actually realize they had a generator for powering all sorts of mod-cons yet! The 8 folks who had signed in ahead of us, had claimed their 8 bunks in the bunkroom not reserved for the contractors, so we claimed 3 remaining ones for ourselves, and tried to find a spot to put our packs. I went back outside to enjoy the sound of native birds, uh I mean buzz of machinery, and joined a conversation with one of the other hikers, a ranger and a fellow in a DOC uniform who seemed to be with the contractors. In response to a question about why they were doing this work at such a busy time, the DOC uniformed fellow replied that he wasn't in PR and if we didn't like crowded huts, we shouldn't be hiking at a busy time. I said I didn't mind competing for bunks with folks who brought it in our their backs, but asked if they could helicopter all this equipment up, why couldn't they bring tents and cots for the workers. (I did not know at the time that they also had two freezers and a fridge filled with ice cream, beer, wine and steaks, as well as a couple of grills.) All the equipment, supplies and workers had been flown in - although the digger was driven up the track. His response was that these guys work long hours and deserve a good bed. I guess I hadn't worked hard at all, walking up with everything on my back! He also said, we had been warned by DOC, which strictly speaking wasn't the case. We certainly were told nothing when we booked the trip back in October, and the notice on the board a day or two before said a couple of bunks would be used, not twelve, and the slight inconevience I had in mind wasn't the co-opting of my wilderness experience with the smell of deisel. Oh well, we'd be out of here the next morning. This DOC fellow then decided to have some fun with us and said if we wanted to cook, we better get started, since once these guys stopped work for the day, they would take over the cooking area as well. So we all had our dinner early, only to find out that they set up their grills at the rangers hut, so at least they didn't flaunt their steaks in front of us! I will mention that the DOC hut warden seemed quite embarassed by the other DOC fellow and later commented that it wasn't right that they were taking up hut space. And what work was taking place? They were replacing two toilets. Sad to say, at this 24 bunk hut, they'd only brought in one port-a-loo to use while the all other toilets were out of service. And it was pretty well full - must have been all that steak and ice cream. 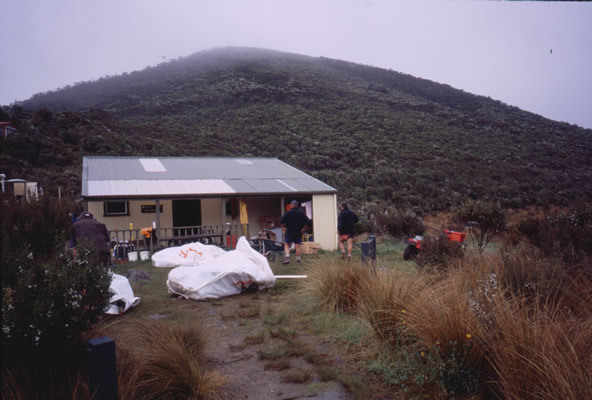 But the best part of the story is that they were finishing up the next morning and moving on to the Mackay hut, our destination in two days time. And they would be there at least a week! With this bit of knowledge, we readjusted our plans so we would skip over the next construction site, by doing a shorter walk the second day, and a longer walk on the third. I don't mean to be a complainer, but it really was frustrating that they were doing this at the height of the season!